A slugger with staying power, Albert Pujols rookie cards are some of the most popular and most valuable in the modern hobby. Known for his home runs and overall hitting ability, his peak years came with the St. Louis Cardinals but he has extended his MLB career with the Los Angeles Angels. Debuting in 2001, Pujols' on-field and hobby career both started with a fresh slate. Together with Ichiro, who also didn't have any MLB cards when he began with the Mariners, Pujols set the hobby on fire in 2001. Collectors busted packs frantically, looking for whatever they could find from the pair. Naturally, Albert Pujols rookie cards saw their ups and downs over the years, but the key cards still command strong prices and can be very difficult to find today. Despite being in his final years, interest picked up again as he neared 3,000 hits. In total, there are more than 40 different Albert Pujols rookie cards to choose from, all of which remain popular today. However, some are more highly regarded than others. The following list highlights some of the best rookie cards for the future Hall of Famer. 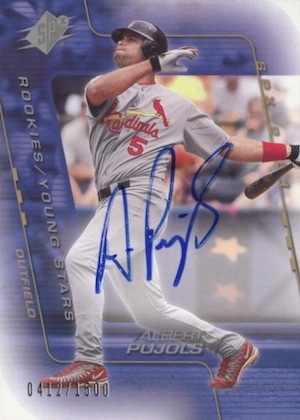 View our complete Albert Pujols rookie card checklist and guide. 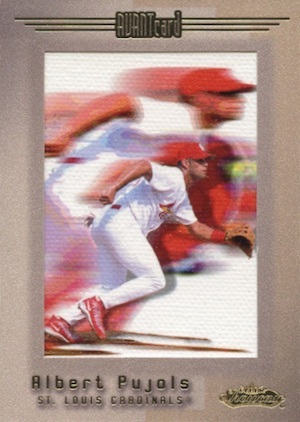 The 2001 Fleer Showcase Albert Pujols rookie card is part of the short-printed Avant Card subset. Numbered to 500, the card has a wild, artistic look. This is a very different take on the foil-heavy Flair Showcase line that preceded it. As the name suggests, 2001 Upper Deck Gold Glove relies on a fielding theme for both the design and many of its inserts. A close-up of a glove acts as the border for this card as the slugger stands, watching a ball soar. It's a sharp shot. 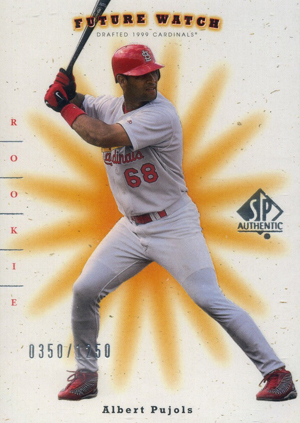 The card itself also stands out among the dozens of other Albert Pujols rookie cards. However, the big driving force of the card is the limited print run of 500. 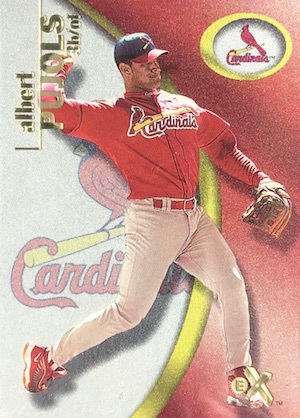 The 2001 E-X Albert Pujols is actually found in packs of 2001 Fleer Platinum XRC. Limited to 499 copies, it's tough to find. The E-X brand, distinct since its inception, has aged well. This is one Pujols rookie that could gain greater notoriety down the road. 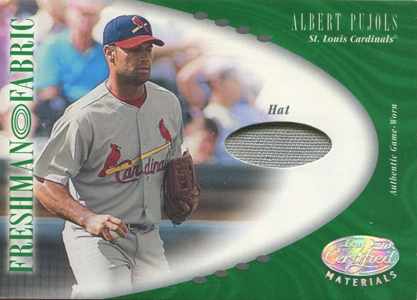 A classy foil card in its own right, the 2001 Leaf Limited Albert Pujols also comes with a diamond-shaped, game-used jersey piece. Limited to 250 copies, the card doesn't pop up often. The low print run is also a big part of what makes it so desirable. 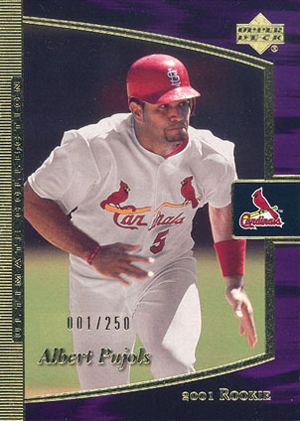 With a print run of just 200 copies, 2001 Leaf Certified Material has the rarest Albert Pujols rookie card. The horizontal card has a tiny piece of a game-worn hat. At the time, game-used cards were coming into their own as a common part of the hobby. Cards like this were able to get by simply because of the presence of a swatch and not the overall design, which comes across a bit clunky. No autographs and no memorabilia swatches, yet the 2001 SP Authentic Albert Pujols rookie consistently outsells nearly all of his other first-year cards. Numbered to 1,250, the card appeals to both rookie collectors and set collectors. Because it's more plentiful than many of the other high-end Albert Pujols rookie cards, it's much more heavily traded. At the time, 2001 Ultimate Collection was Upper Deck's premium release of the year. Although the Albert Pujols card isn't autographed, it is limited to just 250 copies, making it one of his rarest rookies. 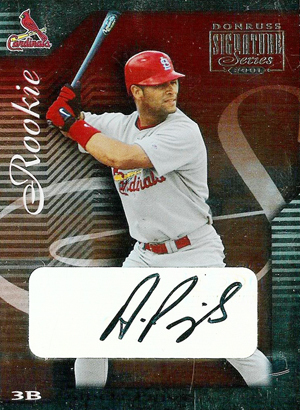 While it comes with a higher print run than many others on the list, the 2001 SPx Albert Pujols rookie is a very attractive card that adds an on-card signature. Numbered to 1,500 copies, the card is randomly inserted in 2001 Upper Deck Rookie Update as a redemption. The release included late-season cards from 2001 SPx, SP Authentic and Upper Deck Sweet Spot. 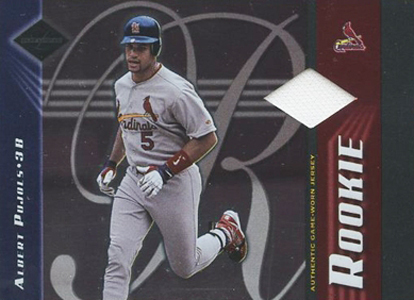 Despite having the lowest print run of all autographed Albert Pujols rookie cards, the 2001 Donruss Signature Series card never reached iconic status. The overall design of the card is solid, carrying a very royal feel about it. But then there's the ugly foil autograph sticker that doesn't blend well into the card. That said, few are likely to complain if they're able to add this card to their collection. The pinnacle of all Albert Pujols rookie cards, this 2001 Bowman Chrome card is easily one of the most iconic cards of the new millennium. Printed on Refractor stock, the autograph is numbered to 500. Unfortunately, the card was a redemption that expired years ago. So even if you are tempted to try your luck and nab one with an unopened box, the best you can hope for is a promissory note that won't be honored. The 2001 Bowman Chrome Albert Pujols rookie has a lot going for it. 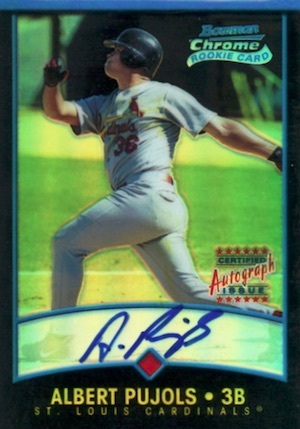 Besides being one of only three autographed rookie cards, it is pushed higher because of the card's brand recognition. Long gone are the days of this card being measured in the hundreds of dollars. 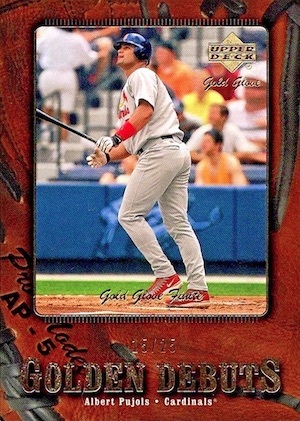 Today, a 2001 Bowman Chrome Albert Pujols rookie card will cost a collector many thousands. It may be a foregone conclusion that the Bowman auto would be number one, but I would go off a limb and say that it is, aesthetically, the most pleasing. If you were just going with non-insert, non-auto releases I’d say his Bowman rookie is number 1. I have a 2001 Albert Pujols Topps Traded Chrome Rainbow Refractor, how rare is this card and how many are in existence. Any info would be appreciated. I have a Albert Pujols Denton Hanna Arizona Fall League card. Very Rare Card! Beckett Graded and ready to sell!